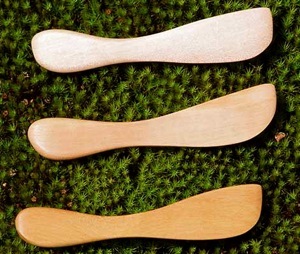 Why in the world would you want to use wooden spreaders or wooden knives? Each culinary knife or spreader is unique and has a personality of its own...like a footprint. I find my hand is drawn to it instead of a production stainless steel knife whenever I put my hand in the cutlery drawer! This personality seems to grow on you and you'll find yourself choosing a wood knife often. My wood paté knives and paté spreaders sure work like a charm and seem perfect for parties as they seem to enhance a party dish of paté or cream cheese. I have had many orders for customers looking for a handmade wood paté knife. My wood butter knife is perfect for spreading butter and can be used as a cheese spreader/cutter as well. The many other uses of these knives I will leave to your imagination! 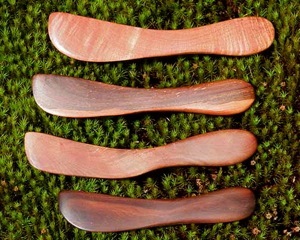 Arbutus Arts wood spreaders and knives come in 3 sizes: small, medium and a new extra small size in one shape only. You can see in the picture at the top the relative sizes. 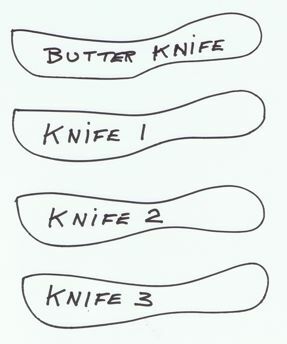 The middle knife is medium in size while the bottom is extra small, perfect for a delicate paté dish or for kids as a toy knife or learning knife. Small wooden spreaders or knives are perfect for butter, for spreading a little jelly or soft cheese or a prepared party spread like garlic cream cheese. Medium wood knives gives you a blade that is larger and easier to pick up a good quantity of what you want. Peanut butter knife par excellence! and many more uses. You'll love the feel of these knives. And the blades are sharp enough to cut through cheese and toast! The extra small is great for applying small quantities and adds a delicate touch to your presentations. Also wonderful for children's small hands as a child knife or a toy knife. It's easy and comfortable for them to use. I guarantee your hand will reach for your wood knife before anything else! The feel of smooth wood in your hand is just so inviting. My butter knife shape is my favorite because it just does such a superb job all the time... butter, peanut butter and its friend—jam. Whatever needs spreading. My problem is I have about 6 in my drawer but my hand goes to my favorite shape. I am sure you will be thrilled with whichever you choose! 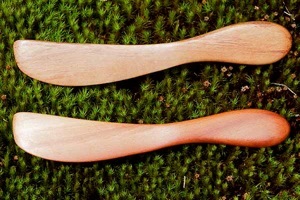 "Butter Knife"...a wood butter knife you will love! "Knife #3"...more delicate handle faces up on this fine shape for use as a paté knife or caviar spoon! Extra Small shape...available in one shape only. All wooden spreaders and knives are handmade which means each piece is unique and will not exactly match what you see in the photos. It will match the quality and styles you see in the pictures. 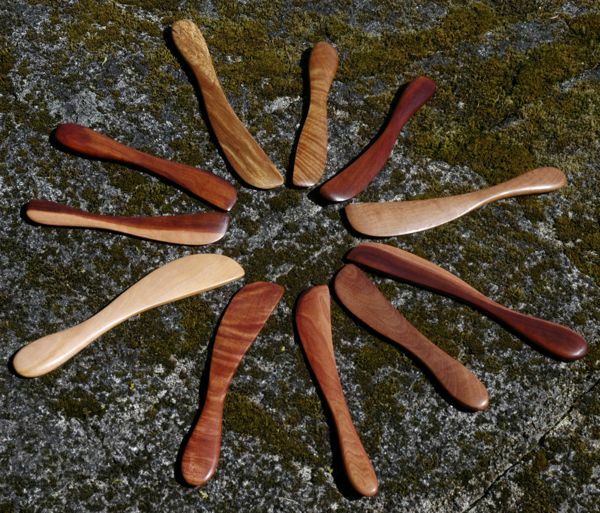 All knives have a natural food safe wood finish: a quality walnut oil wood finish that enriches the grain. The Ultra and Supreme Selections have an additional food safe wood finish of my special combination of walnut oil, beeswax and orange oil. Price is the same no matter the size as they take the same time to make. In fact the smaller they are the harder they are to make! Why because they are so hard to hold while sanding them. So just choose the size that works best for your needs. ...It's the warmth and beauty of the wood that touches you with its direct connection to nature.